※ Support Audio: MP3 / WMA / APE / FLAC / WAV, etc. ※ Tuner Features: FM 87.5-108MHz. ※ SD Card Slot, SD card have music into SD connect can to play. ※ Digital high-quality FM stereo radio. ※ Built-in Bluetooth microphone. Support Audio: MP3 / WMA / APE / FLAC / WAV, etc. --Tuner Features: FM 87.5-108MHz. --SD Card Slot, SD card have music into SD connect can to play. --Digital high-quality FM stereo radio. --Built-in Bluetooth microphone. 4、Support APE, FLAC, WAV, DIS lossless audio formats, support for high rate! 1、Bluetooth Handsfree Bluetooth music player. 18、Support shuffle, repeat all, repeat single, repeat directory. FM tuning range. Support modes: APE / WAV / WMA / MP3 / FM. Digital high-quality FM stereo radio. Support USB / SD / MMC card reader. Music Source: 3.5mm stereo headphone jack,Cellphone,Flash drive,SD card. Bluetooth version: 2.0. Supports Bluetooth connectivity, Bluetooth music and Bluetooth calling features. Support TF card, MINI USB, AUX audio interface. Supports MP3 format audio playback. Bluetooth music and talk. FM reception frequency: 87.5-108MHZ. Supports Bluetooth connectivity, Bluetooth music and Bluetooth calling features. Stereo RCA output can be an external subwoofer. Supports MP3 format audio playback. Bluetooth music and talk. FM reception frequency: 87.5-108MHZ. Supports Bluetooth connectivity, Bluetooth music and Bluetooth calling features. Supports MP3 format audio playback. Bluetooth music and talk. FM reception frequency: 87.5-108MHZ. Built-in Bluetooth 2.1 EDR and microphone, hands-free calling, built-in 2 speakers. This is a FORD radio code service. Serial numbers starting with V or M. The serial number is located on the side of your car stereo on a label or on top of your stereo. Covers all Ford models from your focus to Galaxy etc. Support Audio: MP3 / WMA / APE / FLAC / WAV, etc. Tuner Features: FM 87.5-108MHz. SD Card Slot, SD card have music into SD connect can to play. Digital high-quality FM stereo radio. Built-in Bluetooth microphone. Being the 2005 model it has an auto reverse tape deck and features 4x24 watt output. This is the correct code for the stereo. This item is in good working order; I tested it while in the car and everything worked fine as it should. VOLVO S70 V70 C70 RADIO CD CASSETTE TAPE PLAYER RDS CAR STEREO CODE SC 805. Condition is Used. Supplied with radio code. Was working when removed to fit newer unit. Dispatched with Royal Mail 2nd Class. Very rare Cassette player for the RX8. Support Audio: MP3 / WMA / APE / FLAC / WAV, etc. SD Card Slot, SD card have music into SD connect can to play. Tuner Features: FM 87.5-108MHz. Support USB / SD / MMC card reader. USB Connector, USB have music into USB connect can to play. LAND ROVER ~ FREELANDER. :RADIO ~ CASSETTE. UK MAINLAND ONLY . F.Y.I. :Code card supplied. Vintage Realistic Stereo Car Cassette Player 12-1807A with Manual New In Box. Includes original box, connector wires, owners manual, brackets (mounting hardware), screws, washers and stereo cassette player. All original and many parts are still sealed in their original factory packaging. The rubbed spots on the metal are from the metal installation brackets rubbing against the stereo inside the styrofoam shell they were packaged in together. The plastic packaging the stereo is sealed in has not been opened. Due to the unit’s age and the inability to test it, I cannot guarantee that it will work once you hook it up. You are buying “as is”. No returns. ROVER 75 MG ZT MK2 2004 - 2005 ALPINE TAPE PLAYER STEREO SAT NAV YIE000310PUY. Dispatched with Royal Mail 1st Class. VW BLAUPUNKT BRISTOL 24 VINTAGE CAR RADIO CASSETTE PLAYER SCIROCCO POLO Mk2 etc. BLAUPUNKT BRISTOL 24 VINTAGE CAR RADIO CASSETTE PLAYER. Ideal for VW SCIROCCO POLO GOLF JETTA DERBY PASSAT SANTANA Mk2 SERIES etc.. Condition is Used. I had this fitted in my Mk2 SCIROCCO some years ago but replaced it for an original VW unit. As you can see it comes with paper work including a schematic diagram. Very rare and a nice unit for a VW AUDI restorer. Selling as sold as seen for spares or repairs as I have no way of testing this, even though it was working when removed. Dispatched with Royal Mail 2nd Class signed for. In good working order, rare opportunity to find stereo which still plays cassette tapes well. Condition is Used. Parts can also be collected from out warehouse in Plaistow, London. Support Audio: MP3 / WMA / APE / FLAC / WAV, etc. Support USB / SD / MMC card reader. Digital high-quality FM stereo radio. Built-in Bluetooth function on microphone. 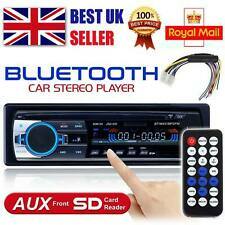 1 x Bluetooth Car Stereo Player. 4B0035186D Audi A4 B5/A6 4B/A8 D2 Radio Concert. Condition is Used. Dispatched with Other Courier 5 days. Good used condition. Mazda MX5 - Mk2.5 (NBFL) - Head unit / stereo / radio cd and cassette player - Black - fits 2001-2005. PM Sports Cars LTD: The UK's largest used Porsche and Mazda MX5 parts supplier. With humble beginnings in 1983 as a hobby restoring Triumph Spitfires, PM Sports Cars LTD has evolved to specialise in all models of Porsche and the Mazda MX5. SONY WX-C570R CAR STEREO RADIO CD PLAYER AND TAPE PLAYER USED CONDITION BRILLIANT CLASSIC RADIO . MINI RADIO STEREO CASSETTE TAPE PLAYER Part numbers - 65.12-6918529 Condition is Used but in good working order, comes as pictured. Any questions please ask Dispatched with eBay delivery – Shutl 2-3 days. Free delivery. Ford Sound 2000 Radio cassette. Ideal for classic car project. VOLVO V40 S40 CD RADIO CASSETTE PLAYER. COMPATIBLE WITH CD CHANGER. All stereo are tested thoroughly security marked internally and security labelled externally. SUPPLIED WITH SECURITY CODE. Case is for removable front bit. London, Primrose Hill area if picking up. Kenwood krc-597 comes complete with remote any questions email or text or phone on 07597732653. With a plethora of parts available on the shelf, we should have the part you require. Best of Rover Spares LTD. It represents the standard we aspire to achieve on goods marked as such. Third Party Rights:-. (Radio Cassette Player. 17 ) 1.00 (-) P21,P32,SRT32DM960,Sound 2004/2005, Sound Level. 17 ) 1.00 (-) SRT22DM1820,SOUND 2004/2005, Stereo Balance. THE ABOVE IS A GUIDE ONLY. from 01.08.1982, to 31.01.1993. Here we have a sort after Becker Be-4370 high end head unit. Aux output for I Pod, I Phone,CD player ect. USED & GOOD WORKING ORDER WITH KEYCODE NICE CONDITION. SEE PIX. KEYCODE is PRESENT. FORD SOUND 2000, 2015 model. if yours are cut off your cars loom. (Just search for Sierra leads). AM/FM RADIO CASSETTE. Peugeot 205 Gti Rare Car Radio Stereo Cassette Clarion. Condition is Used. Untested but it’s in good condition, missing one little cover on one side. These are becoming rare now. Collection in person only. Condition is Used / been tested tape plays fine / radio / functions work DISPLAY IS BLANK / probalbly backlight bulb gone so could be fixed .